Would you make a good phlebotomist? Take our career test to find out how you match with this and over 800 other careers. What is the workplace of a Phlebotomist like? A phlebotomist is someone who is well trained in the skill of taking or drawing blood from living people or animals in a clinical environment. By using venipuncture, which is the process of making an incision in the vein to draw blood, phlebotomy personnel can collect blood samples for the purposes of research, testing, donations, or transfusions. A phlebotomist works under the supervision of a medical laboratory scientist. Some countries, states or provinces require the certification or licensing of all their phlebotomy personnel before they can enter the workforce. They are an essential part of a successfully-run lab facility, and are some of the first people that patients will see when entering a clinical lab for testing. The phlebotomist tests and analyzes the blood samples they have collected using sophisticated laboratory equipment. Phlebotomists must also have excellent attention to detail. Making sure that each test sample is labeled correctly is extremely vital if the right test is to be performed on the patient’s blood. This becomes even more crucial if the patient is being tested for a life-threatening disease or virus. The hazardous nature of dealing with blood means all phlebotomy personnel must strictly and constantly adhere to all laboratory safety procedures as mandated by the company and OSHA (Occupational Safety and Health Administration). They must see to it that the lab area designated for phlebotomy is well cleaned and sanitized after each patient leaves to prevent the spread of diseases. Phlebotomists draw blood from arteries and veins in order to get samples. An often understated part of a phlebotomist's job is their duty to make the blood drawing experience as pleasant as possible, from making the needle incision relatively pain free, to calming down people who are afraid of needles. Without this skill anyone practicing phlebotomy would have a difficult, if not impossible time trying to do their job with any proficiency. Phlebotomists must have excellent dexterity, while staying calm and working effectively under pressure. They may encounter thirty or more patients in a day, each with different reasons for having their blood drawn. If the phlebotomist is not focused on what they are doing while staying calm amidst the possible irritability of some patients, not only can the wrong test be done on a patient’s blood due to wrong labelling, but the test samples may also get cross-contaminated due to lack of concentration. Cross-contamination occurs when two or more blood samples interact unintentionally with each other. Phlebotomists must not only be good communicators, but also good listeners. Being able to listen and adjust to the needs and desires of the patient could be the difference between a stress-free patient visit and a stressful one. All phlebotomists today must be able to work with computers and other high-tech lab equipment. Are you suited to be a phlebotomist? Phlebotomists have distinct personalities. They tend to be conventional individuals, which means they’re conscientious and conservative. They are logical, efficient, orderly, and organized. Some of them are also investigative, meaning they’re intellectual, introspective, and inquisitive. Does this sound like you? Take our free career test to find out if becoming a phlebotomist is right for you. Phlebotomists generally work in a clinical setting in a variety of places. 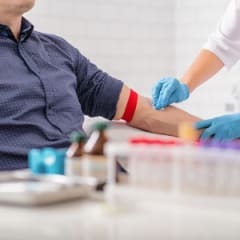 Blood banks, physicians offices, home health agencies, hospitals, clinics, research institutes, commercial laboratories, pharmaceutical firms and public health facilities are the places one would typically find work as a phlebotomist. Public health facilities are usually very busy and understaffed, making that environment very stressful to work in. Work times can vary, especially in hospitals and 24 hour clinics, however in most other facilities a phlebotomist can expect work hours to be between 7am to 7pm during weekdays and varying hours on weekends.